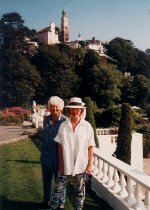 The picture below shows June Wyndham-Davies and Norma West. June Wyndham-Davies has been deeply involved in the Sherlock Holmes' Granada T.V. show and producer of several of its series. 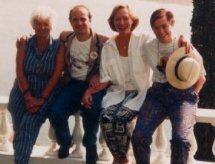 She was with Norma West in Portmeirion in August 1996 for the annual convention of the Six-Of-One, the Prisoner appreciation society. Helen Cohen and Baptiste Marcel met and interviewed her. Norma West played in one of the Sherlock Holmes episode (The Master Blackmailer), but the reason for which she attended the Six-of-One convention was because she played one of the leading roles in the episode Danse of the Dead of The Prisoner. Most of the people linked below are in the Internet Movie Database. HC: Could you start by telling us about your work with the series and your role within it? JWD: I had done a very successful series called Cribb, and it made a lot of money, and as a result of that, Granada was able to take on Sherlock Holmes. Now, The Adventures... -the first 13 hours, was done by Michael Cox. 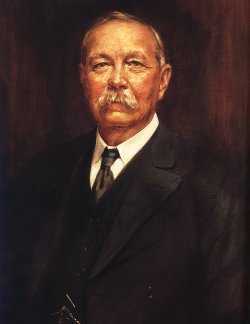 He had a great love for Conan Doyle. One of the most interesting things is, and I like to be credited with this, was the suggestion of Jeremy Brett to play Sherlock Holmes. Peter Eckersley, who was the head of drama, died, and we went to his funeral. I was with a quite well known director at that time, and they were asking him whether he would like to direct Sherlock Holmes. He said that it depends on who plays Sherlock Holmes. I said, "I've had a brilliant idea. I think it should be Jeremy Brett". We can date it absolutely from that time of the funeral. They said it was a rather surprising thought, because he was considered to be a matinee idol at that time; very good looking, not the sort of man you would imagine Sherlock Holmes to be. Several months later, I suddenly heard on the grapevine that it was going to be Jeremy Brett, so I was very pleased about that. Later on, it became my turn to take over as producer. I did The Return of Sherlock Holmes, 13 one hour episodes, The Sign of Four which was the first film on 35 millimetres that Granada had ever made. I think it's a very successful film. We have seen it on the big screen , and it really does very well. Then we went on to do The Casebook, but in between, Michael Cox came back to do six, and I went on to do several 2 hour movies. Some of these were because the stories had become quite difficult; they were about 2-3 pages long and not a lot happened. We had to consider how we could do certain things. The Vampire' was one - it was very short and we worked out that we could turn this into a film, particularly as there has been a lot of media pressure to do something like this. I don't know if you know this, but the two biggest audience pullers in the world are Sherlock Holmes and Dracula, so it was a very good idea to make this film. We got a lovely cast, we went to the most marvellous village for it, and I thoroughly enjoyed it - and people were frightened when they saw the film. HC: Have you ever read any of the Conan Doyle stories, and what is your opinion of them? JWD: Yes, of course. I had read them long before I did the series. I think he is a most marvellous writer. I also very much like the series done by the BBC about the time when he was training to be a doctor, and I think they would be very good to be done again. HC: Could you tell us a little about what it was to work with Jeremy Brett on the series? JWD: Well now, a little bit you say? I could talk for hours and hours about Jeremy Brett. He was one of the most surprising people you could ever come across, because he had two sides. One, he was kind, loving, demonstrative and you couldn't ask to be with a better person. When his depression was upon him, and he suffered from depression of the worst kind, he was a different person entirely. I've never know anyone whose personality could change so much. he would become aggressive and not want to continue. I had so many conversations with Jeremy about not wanting to continue as Sherlock Holmes. He felt that Sherlock Holmes had turned him into a monster. Jeremy Brett was like that before he ever came to Sherlock Holmes, but it wasn't his fault and it certainly wasn't Sherlock Holmes fault. HC: Did you work with both the actors who played Dr. Watson - David Burke and Edward Hardwicke? JWD: I met David Burke when I was going to do The Return , the first of which was The Abbey Grange. He had just had a wonderful offer which was to go to Stratford Memorial Theatre and play, with his wife. He came to me, and he said, "This is terrible. You are going to take over, and I am leaving, and it looks so bad. I'm so sorry, but I can't miss this opportunity." One of the things I have done throughout my career, is that if an actor has had a chance that is going to enhance his career, I had never stopped him and I never would. It was Edward Hardwicke I chose to be Dr Watson, and I actually believe he was better. HC: Was Edward Hardwicke different in style and approach to the series from the previous actor, David Burke? JWD: Yes. David had a more 'modern' approach and a more abrasive personality. Edward is to me the definitive Dr. Watson. He has everything that Conan Doyle speaks of. He is the most lovely actor to work with and he is a great personal friend. HC: When you first started making the series; bearing in mind the huge number and variety of previous adaptations of Sherlock Holmes, both national and international, how did you approach making your own series, and did you find that any of the previous adaptations had influenced your work? JWD: I'll tell you quite honestly that I didn't want to do it. I went and I said, "Listen. I've done Victorian detectives until they are coming out of my ears and I don't want to do them anymore. I'm fond of Jeremy, but I don't want to have to take all of his problems, tribulations, etc." Because he was becoming very ill even then. Anyway, I was convinced that I had to do it. I decided that I must, from my own point of view, as there had been so many previous attempts, make it as visual as I could. So I took it out of what I considered to be the box-like theatre way of doing it, and made it hugely visual. I got the best film-makers I could find to direct, and Peter Hammond is one, in my opinion. BM: One of the things that amazes us in France, is the beautiful landscapes, and cottages It is really typical England, and has a je ne sais quoi. JWD: Well, we were very lucky. One of the worst things is trying to show London as it was in Victorian times, and Manchester cannot be London. Manchester was the home of our recording studios. So, we had to go to Liverpool and surroundings to be able to get the look of London. The big plus was that all around Manchester, into Cheshire and surrounds, there are some of the most wonderful mansions you could ever find, and some of the best scenery. We had such a choice. HC: Previous Sherlock Holmes' tend to have been played as somewhat stilted, arrogant upper-class types. Jeremy Brett had an entirely different approach. He played a very explosive, enthusiastic, exuberant Sherlock Holmes. How much of this was him, and how much your adaptation? JWD: Well, he was totally idiosyncratic. When he was asked if he would play Sherlock Holmes, he said straight away, "No !" He certainly would not. The irony about Jeremy Brett is that he was from a stiff, upper-class kind of family. He was Eton educated and went after that, much to his father's horror, to drama school. His father was ex-army, a Brigadier General, who had been gassed during the war. That's the family he came from. He was totally English upper class. You could hear it in his magnificent voice. I will tell you one thing, that Laurence Olivier told him when he joined the National Theatre. He said, that to be an actor you require two things. It is the voice of an orchestra, and the body of an athlete. HC: What did Jeremy Brett think of the voice-overs of Sherlock Holmes for the international marketing of the series? JWD: He said that the French had given him a good voice -he liked that, but he hated the German voice. He said it sounded too effeminate. BM: The French voice was Jacques Thébault. He was also the voice of Patrick McGoohan in Danger Man and The Prisoner. He also is the voice of Bill Cosby in a few shows! He has a lovely deep voice. HC: Most of the previous Watsons were played as idiots or buffoons to contrast sharply with the intellect of Sherlock Holmes. The Watsons in this series were completely different. They were played as sensitive, intelligent medical men. Can you tell us how this came about? JWD: The thing is, if you read your Conan Doyle, he can't be a 'bumbler', or why else would Sherlock Holmes leave him in The Hound of the Baskervilles to get on with it. Sherlock is hardly in the Hound, just popping around the countryside. Just to mention Edward Hardwicke. His father was Sir Cedric Hardwicke, a famous English actor and star in Hollywood. As a little boy, this 'English set' were all there -C. Aubrey Smith, and Nigel Bruce whom he adored. Edward took a little bit of Nigel Bruce, and a little bit of his father, but essentially what comes through is himself. HC: A major issue in Sherlock Holmes is his use of drugs. Throughout the canon he does abuse cocaine and other stimulants. How did you broach this issue, which is so sensitive in the modern world. JWD: The first series had faithfully had him taking the seven per-cent solution. But, at an early point, we went to Cornwall for The Devil's Foot. I had been terribly worried, because we had the police coming to us about would we help the drug abuse issue. Here we have a leading man 'shooting up'. I approached Jeremy about this, saying, "I know you want to stick as closely as you can to the original, but how would you feel if we showed you giving it up?" As you know, he starts off very ill in The Devil's Foot. He went away and thought about it, and came back saying, "You are absolutely right. I will give it up." So we worked out how he would bury the apparatus in the sand, and we never went back to it again. There was a moment later in the series when Edward Hardwicke opens the drawer to see whether Holmes has taken the stuff out, but it was there undisturbed, to show that he has not used it. 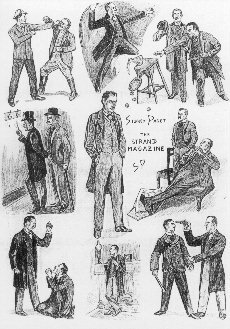 HC: When the series started, the emphasis was very much on trying to keep it as close to the canon as possible, to the extent of seeing scenes taken from the original drawings by Sidney Paget in The Strand Magazine. A lot of the later ones, for example, The Master Blackmailer, and The Sussex Vampire actually strayed a long way from the canon. How do you feel about this? JWD: We got to the point where we were truly running out of material to make a full hour. So, we would take bits and pieces and expand on them, like The Master Blackmailer. Charles Augustus Milverton is one of the most marvellous characters I think, but there is very little to show what he does in the story. We used writers that had adapted the previous stories most faithfully, and they would then invent certain bits. For example in The Dying Detective, the whole front of The Dying Detective was an invention which made the short story really work. We tried awfully hard and Jeremy fluctuated. Sometimes he would say , "This is the most wonderful script I've ever done", and then sometimes he would say, "Oh, but you have strayed from the original story." And to me afterwards would say, "It was rather good, wasn't it?" But never to them. And different people would write different things in various magazines. I would almost give up; I had got to the end of my tether. HC: Mrs West, you mentioned that you played the major female role in The Master Blackmailer, and how you enjoyed putting your foot on the face of Charles Augustus Milverton having shot him. You also mentioned that you liked playing villainesses. This role is somewhat unusual in that she is a victim, but at he same time a killer. Could you tell us more about that? NW: You have to understand that she has been completely and utterly driven to it. The lives of many people will be ruined if he goes ahead with his threat. I think the most interesting thing about the episode is that Sherlock Holmes and Dr. Watson witness the whole thing, and do nothing. That is extraordinary, especially when Holmes picks up her buckle and removes the evidence from the scene. She was a very straight forward woman who made a bad mistake. She fell in love, and did the worst thing -put something on paper. We must all remember not to do that! And then circumstances took over and one worked it through from there. It's a slow build of emotion. What am I going to do about this? How am I going to resolve it? It is going to affect other people's lives -this can't happen. It's a slow progression, like climbing stairs. HC: Jeremy Brett was often accused, especially in the tabloid media, of ham acting, which personally speaking I think extremely unfair. What do you think of this? JWD: I've got a thing about tabloid journalists. They would not know ham acting if they saw it. The word ham comes from amateurs playing Hamlet. Jeremy was a brilliant actor, and I won't have otherwise. Towards the end, he did have difficulties with his respiratory system and getting the breath he wanted, and stature. Nobody knew better than him -the crumbling edifice if you like. But no, I won't have that. I think he was an idiosyncratic but quite definitive Holmes. HC: During the series, there was hefty media coverage of the time when Jeremy had his breakdown. He suffered from maniac depression, which can make people fluctuate tremendously. Did this ever affect his acting, or the production? JWD: It affected the series and the production because we would have weeks when he couldn't work. I can talk about this now that Jeremy has died, but he was 'sectioned' and he went to what, in the old days, we would have called an asylum. He had a dreadful time there, and I used to go and visit him there. It took a long time, but I eventually got Granada to foot the bills for him to go to a very special clinic. It's a rather remarkable story because he did so well there, and I was seeing him regularly. I went there to pick him up, and two tabloid newspaper man, from The Sun, had actually been clever enough to use his real name at the door, which is Jeremy Huggins. They went up to his bedroom where he was waiting for me, burst in with a camera, and said, "We have come to see if you have got AID's". He kicked them out. Incidentally, I said his name was Huggins, do you know how he got the name Brett? When Jeremy told his father he was going to acting school and he was going to become an actor, his father simply said, "Well don't do it anywhere near where I am, because I don't want a shrieking lot of actors coming here." He said, "Don't use the family name." Jeremy said, "Well what name shall I use?" He said, "I don't care. Invent one if you like." Jeremy had only had one suit taylored for him at that point, so he looked inside his suit and it was by a taylor called Peter Brett. So he said, "Well, I'll use Brett". That's true! HC: During this very low point, the media coverage was awful. Did this affect the ratings, or production of the series? JWD: It never affected the ratings. We always did a very good ten to twelve million. But he was hounded. We were all hounded. They were miserable, horrible creatures. They didn't take on board that he not only had a mental illness, but because he had rheumatic fever at seventeen years old, he had a serious physical illness too. He was on drugs for both, which had side effects. Production wise, of course we lost days and days. There were times when he had to be lifted in a chair to go upstairs, because he was so weak. HC: In the last few episodes, you could see that he was ill. How did this affect his acting? JWD: He had an inhaler that he had to use the whole time to get his breath. The make-up woman fanned him constantly because he dripped with sweat, absolutely dripped. We had to make very short takes and say, "Are you all right?" He would say, "Yes, my darling heart, I'm all right of course!" They gave him cortisone, which puffed him up, like Elvis Presley. We had a terrible time frankly. I found that I wanted to get away from Sherlock Holmes. I loved Jeremy, not just fond of him, but it was very debilitating for me as well. NW: You were never really free of Jeremy. He wasn't a good sleeper at that time, so the telephone rang all night. He would expect you to be up and ready to go somewhere at four in the morning, to have a discussion about something. "My darling! I'm coming round. We must talk about this!" You would say, "But Jeremy, it's four in the morning. I'm trying to get some sleep. We have a six O'clock call. Please give me another hour." The sound people had some difficulty on The Master Blackmailer because there were times with his breathing when they simply had to do things again, because you could hear him gasping. You couldn't have that with Holmes. There was a lack of movement then -none of those lovely little skips and hops, and runs when other people would have walked. Those quick, pivotal turns on the spot. Those exclamations -there were none of these, and I don't know that we have anyone that will do it again. One of the things he used to do was to watch you rehearsing. June, having been an actress herself knows the value of rehearsal. She also knows, having been a producer, if you have rehearsed before hand, you don't waste any time when you actually get on the set. If you have spent 10 days before, sorting out problems, you come and you do it. Everyone is there and ready to go at the same time. Jeremy always used to sit on the side and watch you rehearsing a scene. At the end of Blackmailer, there is a marvellous scene with Robert Hardy. A scene had been written, and it was fine, but it just didn't have any sparks. Jeremy was sitting at the side, and said, "Darlings! I think we should go back to the original." And so, we got the story out, and read it. Jeremy said "My darlings, it's so much better. That's what we are going to do!" So, it was typed up for us, and we learnt it. It was in the old traditional style. Peter Hammond said to me, "When you play it, imagine that you are Tosca. This is an opera. Play it like that -it deserves it." And it did, and it worked. There are people that would say that was ham. I don't think it is. It's passionate, and people have become embarrassed by pure passionate emotion, and I think that is a tremendous shame. JWD: I would absolutely agree with that. I can remember some of the lines -"He was a hound; kill the hound!" But it really, really worked. Doyle knew that when he wrote it. HC: Is this the end of television Sherlock Holmes? JWD: We had approximately ten years of it. Who can tell? I just don't know. Americans nearly always dictate in the end, by the amount of money they have in comparison to us, what they want to see. Well, we have still got a wonderful Watson if they decide to do it again. I think we have got the definitive -I don't know why they would want to do it again. HC: Is there anyone who could even begin to step into Jeremy's shoes? JWD: He was absolutely unique. There is a very good actor, who was in The Dying Detective -he played the wicked man (Jonathan Hyde)- he is a splendid actor, and was playing a vile man in that. I suppose he could take on Sherlock Holmes. I don't know anybody else. HC: Would you agree that it would have to be a British actor, rather than an American? HC and BM: Thank you. File created 30th September 1996, last update January 2000 by Baptiste MARCEL (see page Contacts), located in Asnières-sur-Seine (France). Feedback is welcomed. If you enjoyed this page, please do not forget to visit my homepage and to request more information about this site.